What’s the Value of a Visit for Retailers of Consumer Electronics? In this blog series, we will be diving deeper into our Value of a Visit Report, that was released in September of 2018, to understand the value of a store visit for specific categories of retailers. The first store of focus is consumer electronics—featuring some of this year’s Black Friday foot traffic data! Stay tuned as we continue to highlight different categories, including CPG, Retail, Auto, and Restaurant throughout 2019. So, what is the value of a visit for electronics retailers? It comes down to the ability to combine online knowledge with real-life interaction. For electronics retailers, it is imperative to create digitally enabled physical experiences that merge the two worlds. For electronics purchases specifically, shoppers are looking to interact with a brand both online and in-store for one omnichannel experience. On Black Friday 2018—the biggest foot traffic day of the year for electronics retailers—Best Buy saw the largest spike with foot traffic 290% above their November average. Savvy electronics marketers can prepare for this holiday in-store influx by empowering shoppers with online product information and reviews needed to make an informed purchase decision before walking through the door. Once they’ve visited, finalize the sale by making it easy for shoppers to find what they need efficiently. With GroundTruth’s Cost Per Visit model, it’s easy to encourage offline visits and only pay when in-store visits occur. This allows brands to maximize the power of location to deliver messages at the right place and the right time to ultimately increase visits. 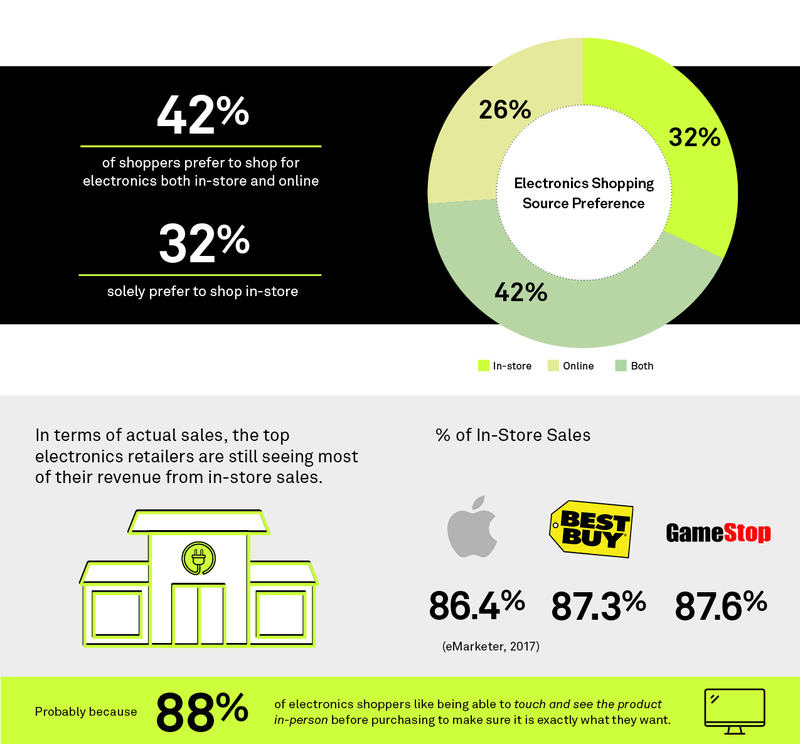 Methodology: In June 2018, GroundTruth surveyed 567 consumers who have purchased electronics in the past 90 days to understand their shopping habits and preferences.